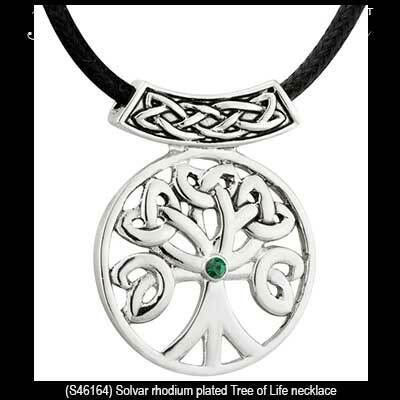 Tree of Life necklace is a rhodium plated design that features Trinity knot leaves along with a Celtic knot-work bail. 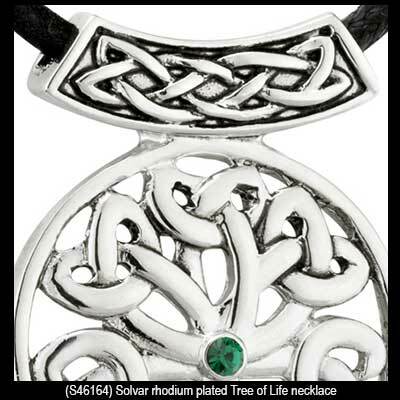 The Tree of Life pendant is enhanced with Trinity knot leaves along with a Celtic knot bail and a green glass center stone. The rhodium plated Tree of Life necklace measures 1" wide x 1 1/4" tall, including the bail and an 18" long black cord with a 2" extender chain is included. 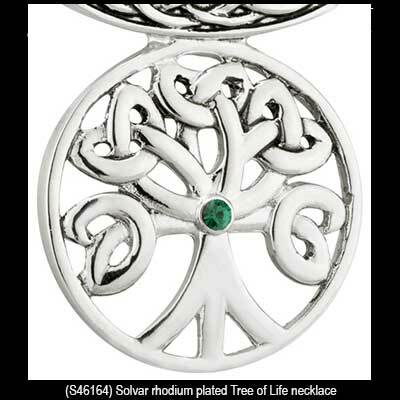 Tree of LifeThe Irish Gift HouseSolvar Jewelry. This Irish jewelry is gift boxed with Celtic knot and history cards, complements of . It is made by in Dublin, Ireland.